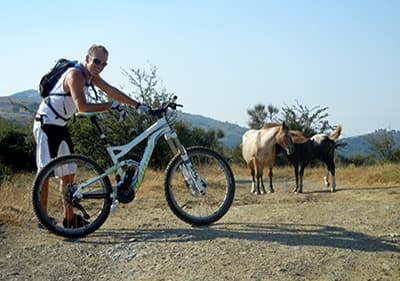 Liguria is a paradise for mountain bikers. We have compiled the most beautiful tours of the region Genoa for you. This is the only route in the protected nature reserve Portofino, on which cycling is permitted. 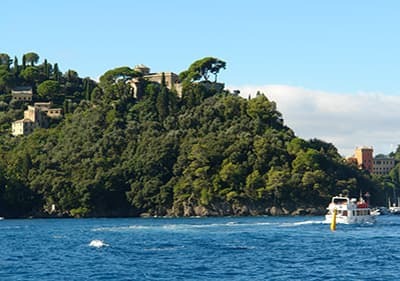 It leads through the unparalleled landscape of the Portofino Peninsula and even beginners can easily master this route. 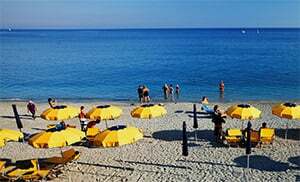 It invites you to a relaxed excursion through the diverse Hinterland of Portofino and takes you from Ruta (suburb of Camogli) to Santa Margherita Ligure. The entire length of the route is marked with the MTB sign (orange triangle with two dots). The starting point is the church in Ruta di Camogli. You start off southwards, until you reach a steep flights of steps that are marked with the letters “FIE”. Follow these until you reach a hotel a few kilometres along. A few metres further, you will see a turn off into a small closed off road. Follow this road uphill to Pietre Strette and continue to Olmi. You will then cross the Valle dei Mulino, before you reach the Capelle delle Gave. From here, you return towards Santa Margherita. The path takes you past idyllic churches, castles and villages. This relaxing tour really allows you to enjoy the breathtaking landscape! This tour takes you through the hilly hinterland of the port city of Genoa along the Via Acquedotto Val Noci. You will pass the historic city walls of Genoa and a multitude of romantic medieval castles. A plateau at the top offers a heavenly view across the entire city, including the spectacular port with its enormous cruise liners and impressive yachts. The tour starts at the narrow-gauge railway station “Campi” of the Ferrovia Genova Casella. You follow the asphalt road Via Forte Diamante up to the trattoria “La Baita del Diamante”. Here, you can stop for some delicious refreshments. Now the cycle and hiking path Via Acquedotto Val Noci begins towards the sea. The gravel track will take you past the medieval castles Forte Diamante, Puin and Sperone. In the 18th century, they were part of the largest defence system in Europe! This is the only castle that also allows visitors to come inside. It is therefore worthwhile considering a small detour to look at the castle. You reach the “Forte Sperone” by following the Via del Peralto for about 1 km. However, if you stay on the Via Mura del Castellaccio, you will arrive at the mountain station of the “Funicolare Genova Zecca Righi”. Sit back and enjoy the breathtaking panorama view of Genoa. The funicular takes you back to the old town in just a few minutes. This impressive tour will take you around the sights of Genoa! Monte Beigua is about 15 km outside the city of Savona and you will notice it immediately due to its antennae installations. A clear sky will reward the mountain biker with a view all the way to the island of Elba. The downhill ride from Monte Beigua is an exceptional thrill. The starting point is the junction between Le Faie and Alpicella. From here, you can enjoy a slight downhill ride towards Alpicella, where you will also find the last bar for a pick up before heading uphill. Then a well build asphalt road leads up to Monte Beigua. After about 13 km, you will reach the mountaintop with its many antennae. The view is simply spectacular: the coast and the sea to the front, the low mountain range and countless hills to the back. On top of the mountain, an “Albergo” (Hotel) offers good food, which is a real treat after the strenuous uphill ride. On your way back, you will pass the Rifugio Pratorotondo, where you can refuel once more. A gravel path runs through the large pastures, which is well build in the beginning, but becomes increasingly narrow and more difficult to manoeuvre. Here, demanding bikers will experience a special treat. The path meanders down a slope into the forest. Care must be taken on this path, as cows, bulls and other animals graze alongside it. Nevertheless, this does add to the sense of thrill. The path crosses several small streams, which guarantees an exciting ride. On the other side of the pastures, you will arrive at the hamlet of Faie and return to the junction, at which you started. Make sure, you don’t miss this adrenalin fuelled ride!